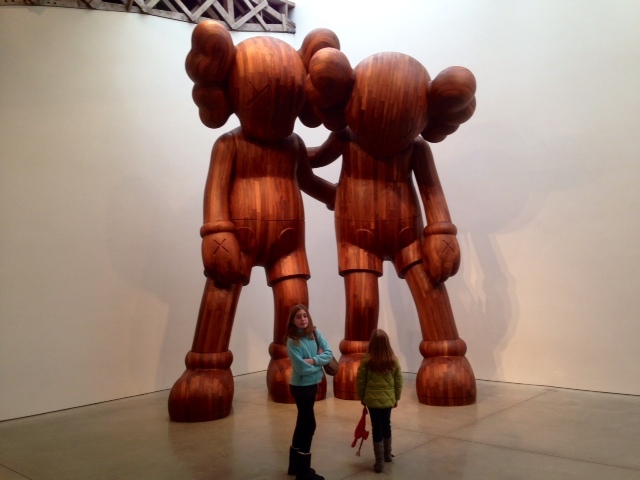 My Bride had to spend Saturday conducting Christmas biz-niz so I took the girlies into the city and went gallery hopping in Chelsea. There’s an unusually robust selection of interesting exhibits up right now. This is all a part of my program to brainwash them into loving New York as much as I do. Plus, as any two-bit psychologist will tell you, I’m trying to be a better father than that poor, broken soul who raised me, which shouldn’t be too terribly difficult. The bar wasn’t set that high. 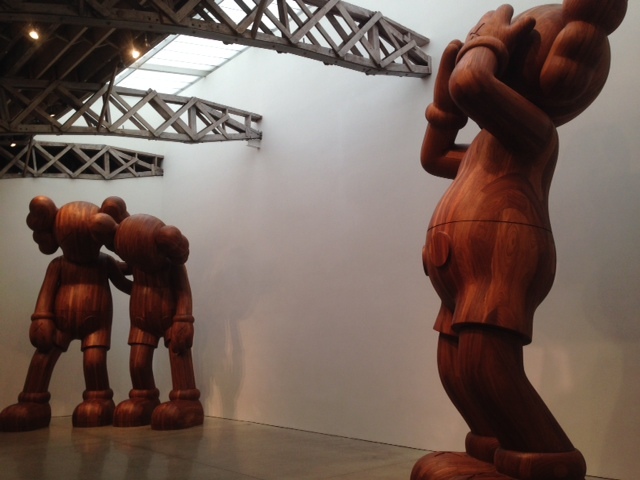 The first stop was the Mary Boone Gallery on 24th St. Two fine, new sculptures by KAWS are on display. This is ALONG THE WAY. 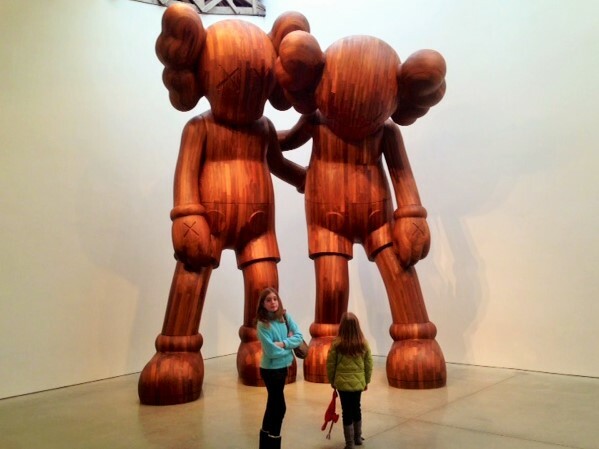 They’re 18′ high and made of wood. They look like two, sad Disney characters who lost their franchise, poor things. I’m not entirely sure what kind of wood he used but it’s polished and smooth with beautiful grain. The wood glows in the light that streams in from the skylights. 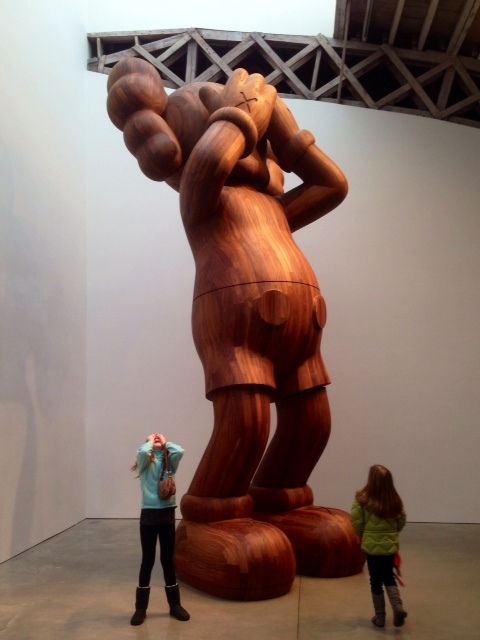 This is the other sculpture. This is AT THIS TIME. Daughter improvised that pose. I didn’t direct her to do that. I’m a proud papa. As with many of these pieces, I’m not entirely sure what practical application can be made. They’re enormous. 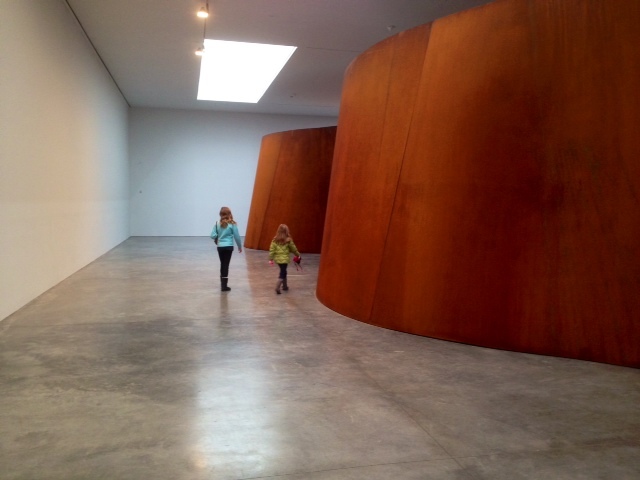 This is INSIDE OUT by Richard Serra at the Gagosian Gallery on 21st St. It’s made from his trademark curved steel walls. Here’s a shot from the catalog that gives you a proper overview of the piece. You can’t really see how expansive it is from the ground. I think they should provide a catwalk or something so you can view it from on high. 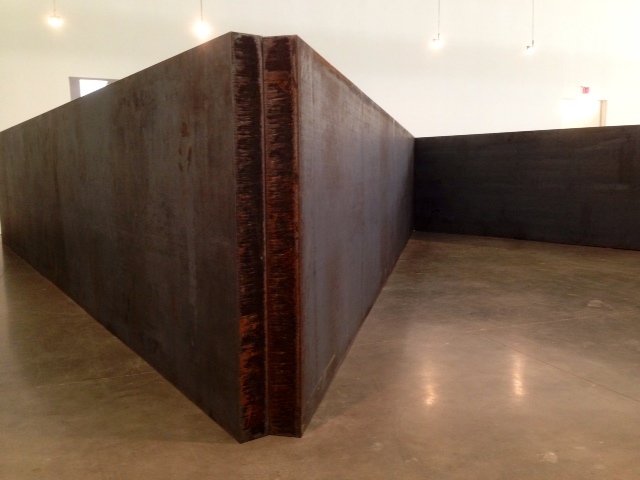 We went to a similar Serra exhibit a few years ago at the same gallery. This stuff never gets old for me. 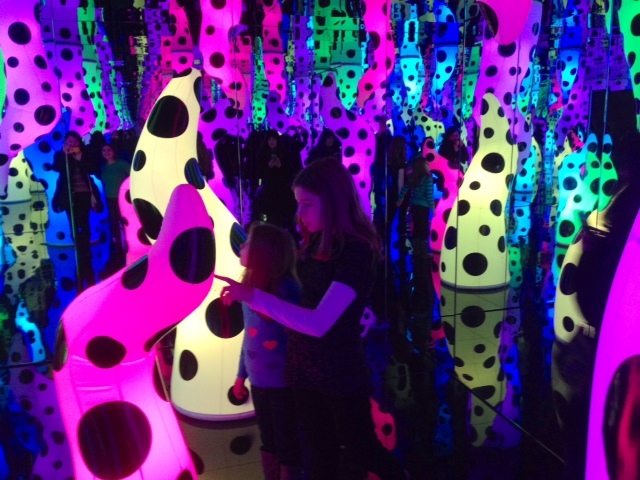 Surprisingly, the girls remembered the last exhibit and even the artist’s name. Mwwhahaha. It’s working. I have to constantly remind the little one not to run her finger along the edge of the wall. 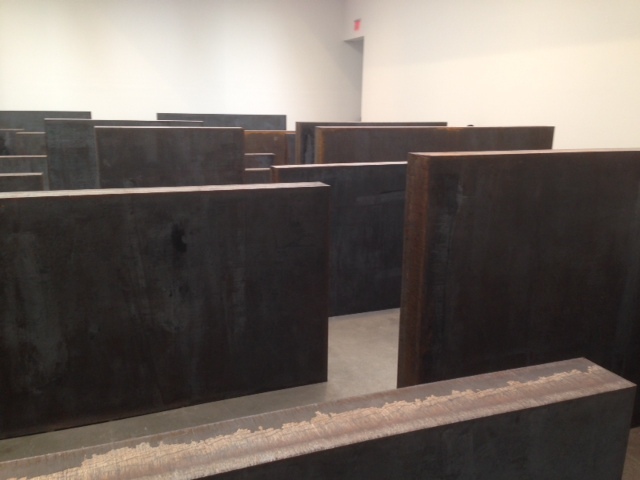 The gallery is paranoid about the oil from your skin somehow degrading the surface. I suppose if enough people did it, it’d have an effect. 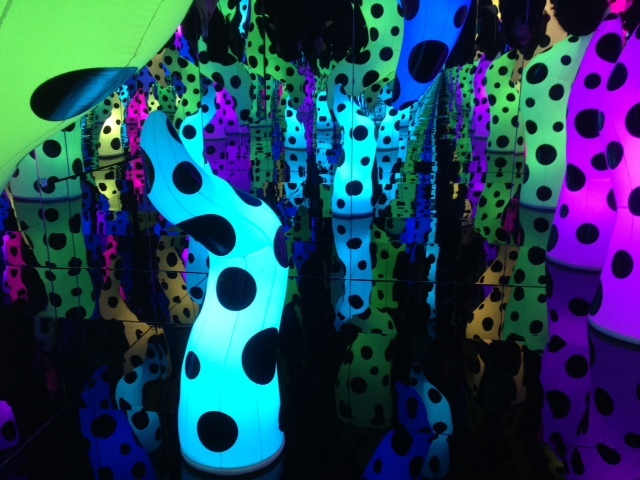 The David Zwirner Gallery on 19th St. is hosting I WHO HAVE ARRIVED IN HEAVEN by Yayoi Kusama. It’s a treat! 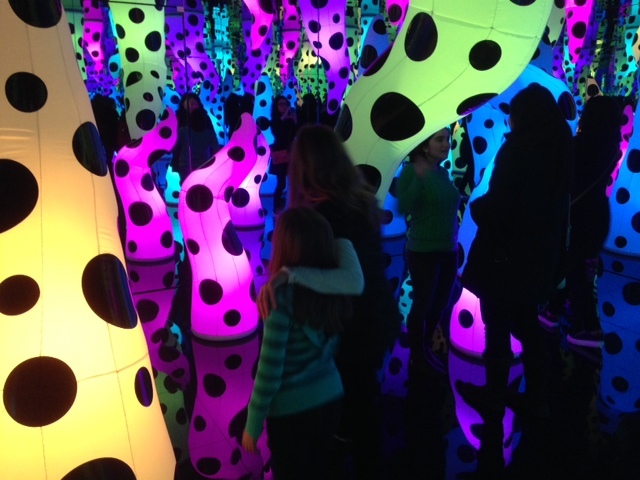 It’s a series of inflatable stalagmites and stalactites that are illuminated from within. The colors slowly change. 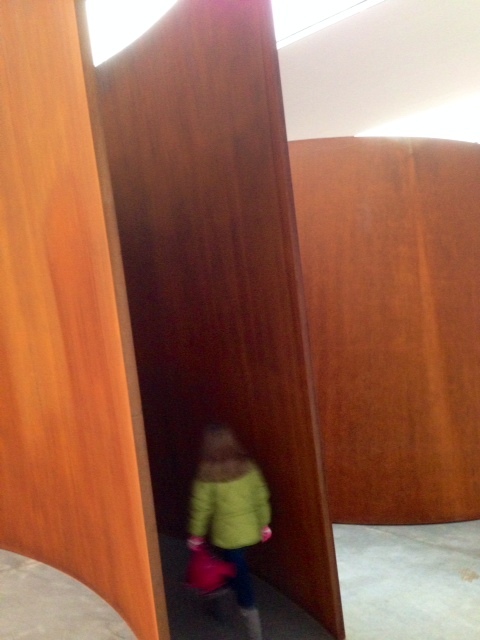 You enter a small room, just a few people at a time–it’s a controlled entry– and are given one minute. 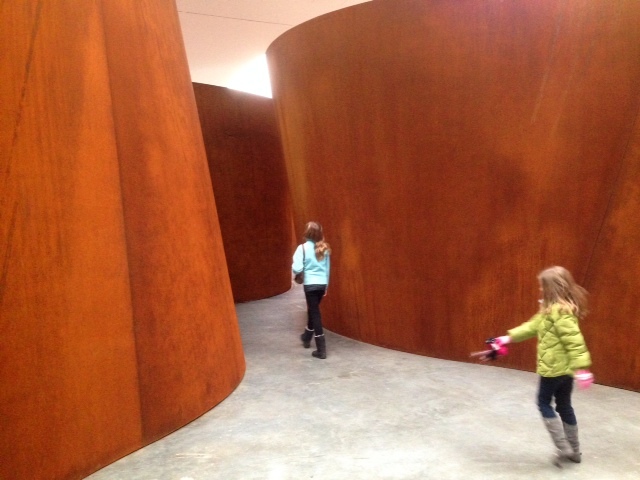 The walls, ceiling and floor are made of mirrors, so once you’re inside and the door is closed, you get a reflection-within-a-reflection infinity effect. It’s quite disorienting. 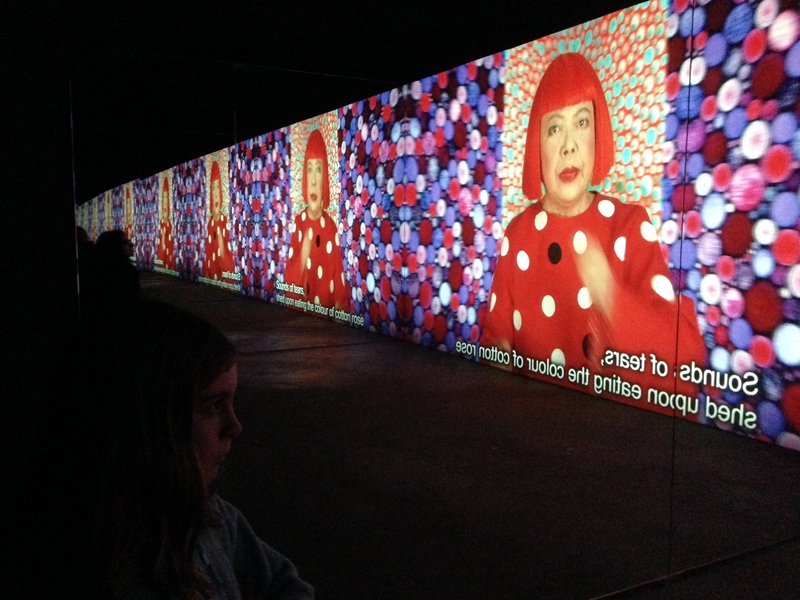 There’s also a brief film of Ms. Kusama reciting a poem. 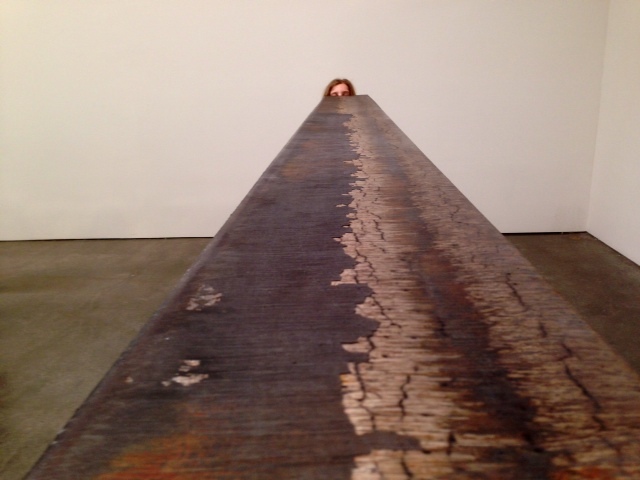 Again, she uses mirrors to effectively convey a infinite depth of view. 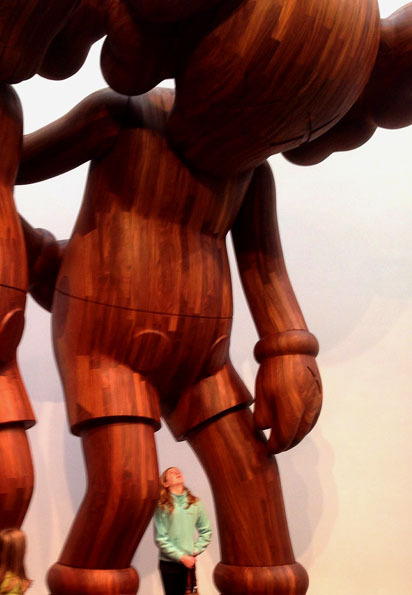 You’ll never guess what’s at the Gagosian Gallery on 24st Street? 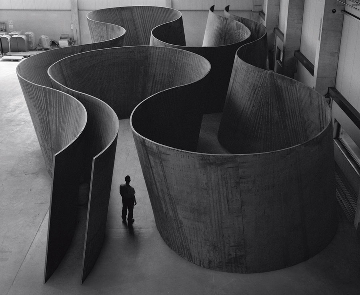 Another new Richard Serra sculpture! 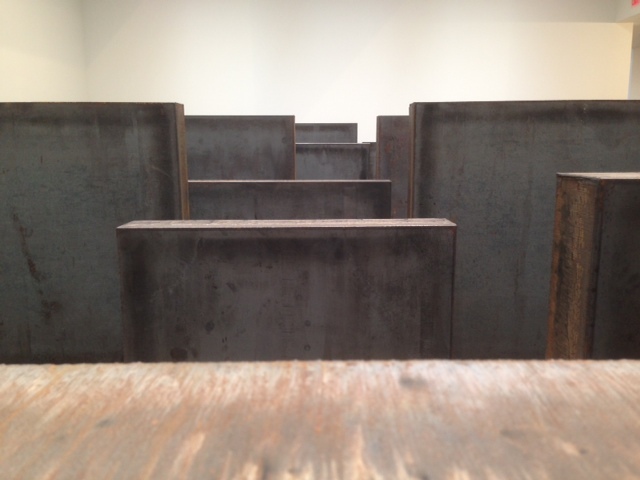 This is INTERVALS, a room full of steel plates in varying heights. 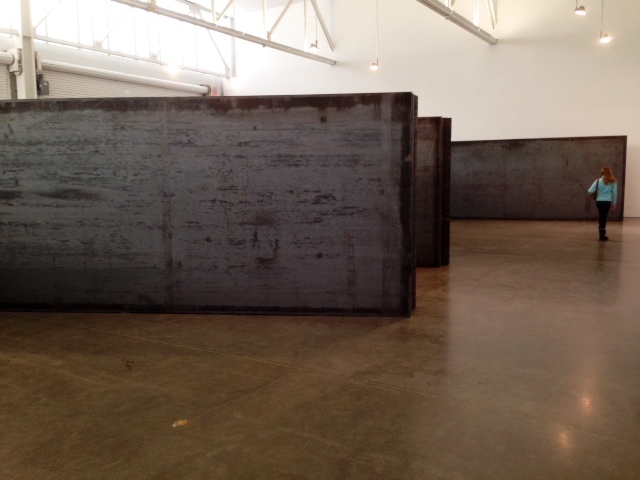 Also sharing the same gallery space is 7 PLATES, 4 ANGLES. Plates stand toe-to-toe and are arranged in a “V” shape. Again, who am I to criticize, but it’d be awesome if they provided a view from on high. $0.00. Nothing. Nyet. Zilch. Right this way, sir. Null. Gratis. Complimentary. Is this a great town or what? 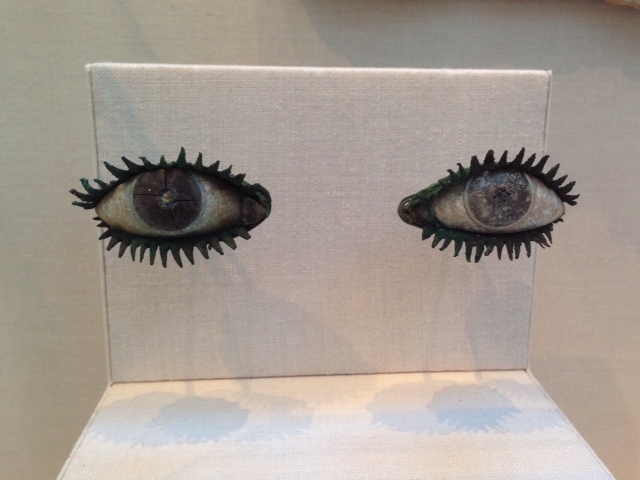 We also paid a visit to the Metropolitan Museum of Art. 12-Year Old Daughter is on a Greek mythology kick and she had an insatiable need to see marble Gods and Goddesses. I won’t include photos of those, but I’ll leave you with this magnificent curio. PAIR OF EYES. Bronze, marble, frit, quartz and obsidian. Greek. 5th century B.C. or later. Huzzah.